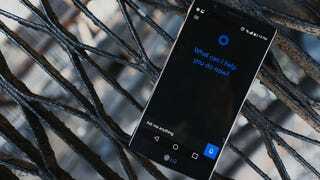 Microsoft just released the public beta for Cortana on Android. Though we already got a sneak peek thanks to a leaked private beta, anybody can now download the personal assistant software in the Google Play store. Just don’t expect to be blown away. Cortana on Andoid seems like a cool idea. The program basically works the same as it does on Windows 10, except the functionality is limited by the fact that Cortana doesn’t have full access to the Android device like it does in Windows. Nevertheless, it’s bound to be helpful to Microsoft fans who want to use the feature across their different devices. As with any beta version, not all the kinks have been worked out so beckon Cortana at your own risk! Note: You may have to wait a tad after opting into the beta before the download link will work.